Would you like a little cheese with that wine? We love having friends over. But we especially love having friends over that love cheese. It’s really fun to do a wine and cheese party because there is virtually no work involved. Just purchase and plate. I love simple, clean entertaining. Our friends were due to arrive around 7:30 which put the party in the dinner hour. 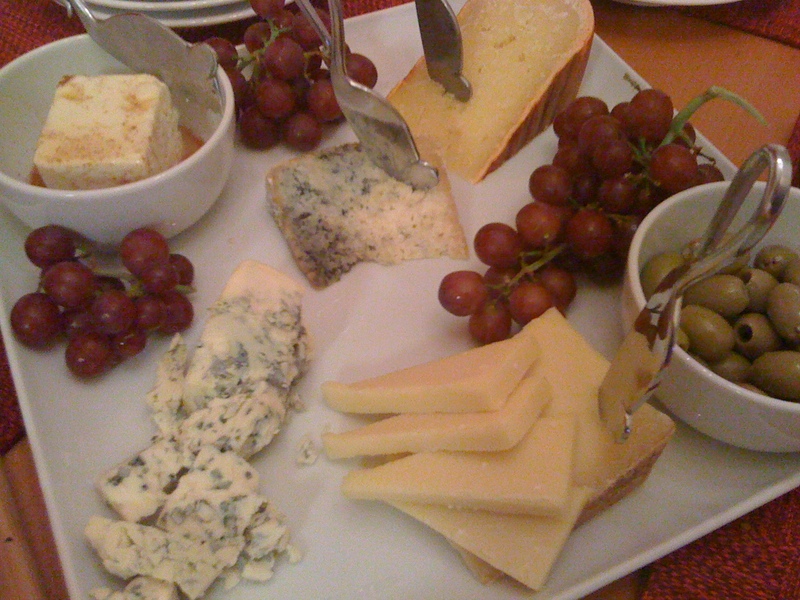 If you are having a cheese party a little later, say around 8:30 or earlier, for cocktails, you could omit the rest of the menu, but I wanted to make sure there was enough to eat and that there were plenty of accompaniments for the cheeses. Yes, I realize that it might look a little intimidating, but actually it’s just a lot of fancy words for simple things. Let me explain. The cheeses are kind of an odd combination. While my intent was to do all Spanish cheeses, I had a few in the fridge that I wanted to use up, and I picked up a few that I love without consideration for the theme. So here I was, with a mismatched combination, but it wound up working out fine. As for what the cheeses are; Mahon is a spanish cow’s milk cheese. It’s a washed-rind cheese that is washed with either olive oil or butter that is combined with a little bit of paprika for color. It tasted like an aged cheddar. It is slightly nutty and fruity with a salty bite and bit of grana (the salt crystals that combine with proteins to form crunchy bits in aged cheese.) Piccoline olive are small green olives from France that are a very fruity and pleasantly briny. Danish blue is a well known medium intensity blue that is mainly used as an ingredient. Cave Aged Gruyere is a Swiss style cheese made is France. It is nutty and fragrant. It has that wonderful tanginess that swiss cheeses bring to a party, but with a more mature finish. The feta is a French feta that is less briny than Greek fetas. Combined with cinnamon and honey, the cheese sings. It’s complimented well by the grapes and a few wheat crackers. Finally, the cabrales. Perhaps the most intense of the Spanish blues, cabrales is a cave-aged blue that can clear your sinuses if you’re not careful. While pungent, it still has a lovely smell that reminds me of Muscat grapes and honey. It can be mellowed with marcona almonds and honey. The charcuterie plate is a fancy way of saying meats. With the exception of the duck prosciutto, the meats came from the deli counter. The duck is a specialty item that was well worth the trip to the Philadelphia Italian market. Fatty, and rich without the overly chewy quality that pork prosciutto can sometimes have. 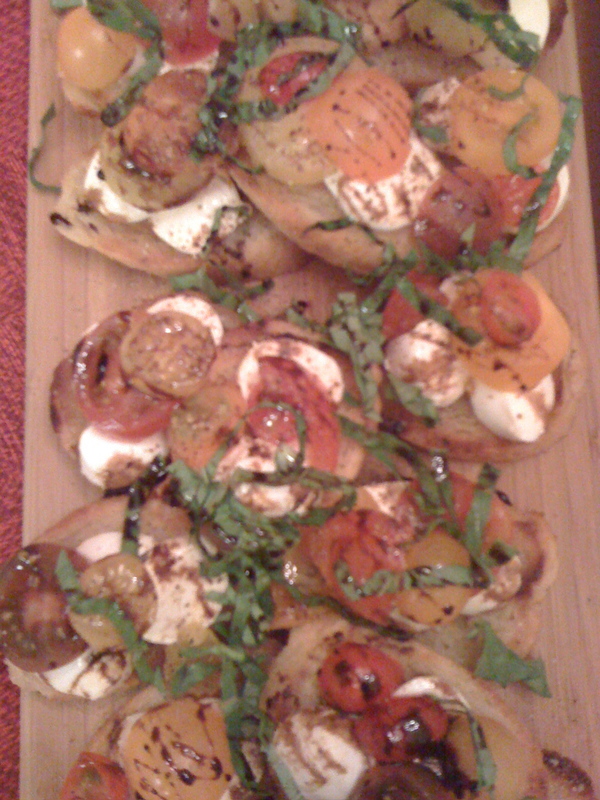 The Caprese bruschetta was simple toasted crostini with mozzarella, fresh tomatoes, basil, and a balsamic reduction. Oh, and salt and pepper of course. I have to say they were a big hit because I only got one. The Apple Crostata is a free form apple tart. I made my own crust, but you could absolutely use a frozen pie dough. Just peel and slice 2 apples, and toss with sugar and cinnamon. 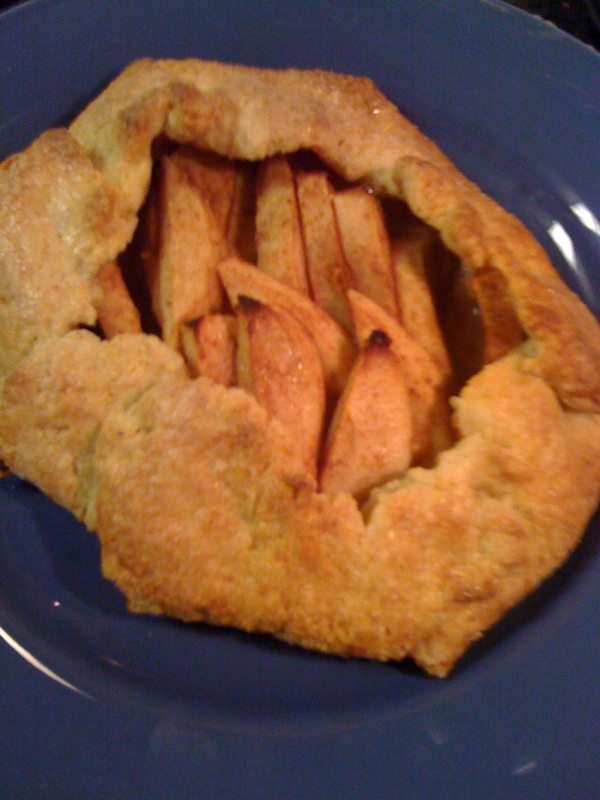 Lay the pie dough on a cookie sheet and pile the apples in the center leaving 2-3 inches around the side. Fold the edges in, pleating as needed. Brush the top of the dough with heavy cream and sprinkle with sugar. Bake for 40 minutes or until the crust is golden brown. Serve at room temperature. To make the chantilly cream, whip heavy cream until soft peaks form, add in 1/2 cup of powdered sugar and 1/2 teaspoon vanilla extract and whip until stiff peaks form. Serve on the side of the cooled crostata. Next time you entertain, keep this simple menu in mind. Everything can be prepared within an hour and the best part, it can also be cleaned up in about 15 minutes!